IRVINE, Calif. and ROCKVILLE, Md., Dec. 12, 2017 /PRNewswire/ - Zymo Research Corp. and Bertin Technologies announce a collaboration that ensures the sample lysis step in the microbiome workflow is complete and unbiased. An application note is available describing the materials, procedure and results attained using the Precellys® Evolution Homogenizer together with the ZymoBIOMICS® Microbial Community Standards and ZymoBIOMICS® DNA Miniprep Kit for purification of the DNA. Using both companies' products, the researcher is afforded unbiased cell lysis in only one minute. The application note validates a procedure for accurate downstream microbiome measurements. Zymo Research's suite of ZymoBIOMICS® products addresses the complete microbiomics workflow; from sample collection, DNA extraction, library prep, and sequencing through bioinformatics and final analysis. The ZymoBIOMICS® Microbial Community Standards contain three easy-to-lyse Gram-negative bacteria, five tough-to-lyse Gram-positive bacteria, and two tough-to-lyse yeasts. These accurately characterized microbial standards enable the identification of exposure to artifacts, errors, and bias in microbiomics or metagenomics workflows, specifically 16S rRNA and shotgun-based sequencing approaches. Used in conjunction with the microbial standards, Zymo Research offers low-bioburden DNA isolation kits tuned for complete lysis of microbes with an innovative bead and buffer system. Bertin has been in the sample preparation and homogenization instrumentation market for over ten years. Their Precellys® homogenizers have won widespread recognition from the scientific community as hardwearing, efficient and ergonomic research tools and have been cited widely in the literature. Initially designed for BSL-3 (Biological Safety Level) laboratories, the Precellys® Evolution makes it possible to efficiently homogenize a number of samples using an assortment of different-sized tubes, from 0.5 ml to 15 ml, and it guarantees identical homogenization in each of the tube positions. Beat beating is an accepted method, within the scientific community, to lyse various microbes; but, until now, the technology has not allowed accurate assessment of the efficiency of the lysis. 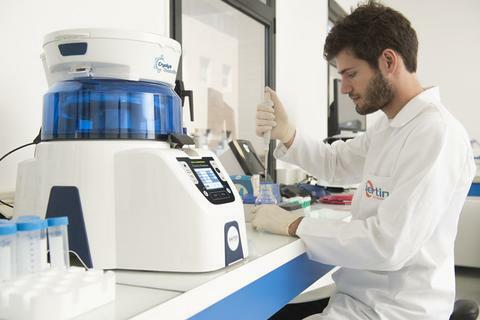 "The combination of Bertin's homogenizer, Zymo Research's Microbial Community Standards, and DNA Miniprep Kit is very effective. Researchers and clinicians now have a rapid, complete homogenization procedure at their disposal," said Marc Van Eden, Vice President of Business Development at Zymo Research Corp. He continued, "There are quite a few homogenizing technologies on the market, and until now, very little scrutiny has been placed on their ability to yield complete microbial lysis. The ZymoBIOMICS® Microbial Community Standards let the researcher test for themselves the 'completeness' of their lysis step so accommodations can be made to their workflow for accuracy and reproducibility sake." For more information about Zymo Research's products, go to Zymo Research's website or email info@zymoresearch.com.For more information about Bertin's Precellys® Evolution Homogenizer and other sample preparation products, go to their website. All trademarks are the property of their respective owners. The Zymo Research Corp. trademark, with its design elements including the stylized three-shaded ovals (budding yeast), and the words "The Beauty of Science is to Make Things Simple," is a registered trademark of Zymo Research Corp.